"If dancing were any easier it would be called football"
VINTAGE WESTERN THEME! DRESS THE PART -- "YIPPY AYE YAYE"
The only thing good about getting older (what happened to the wiser stuff?) is that you get a "Birthday Dance"! 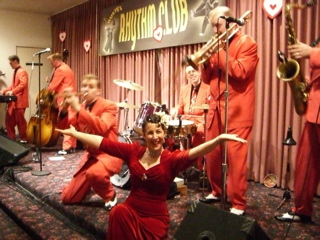 Won't you please join me for mine at the Rhythm Club on February 22nd? AND, as seems to be the tradition, we'll be billing the night as a Vintage Western dress nite. 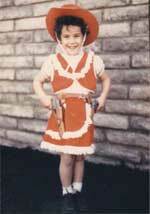 Ever since I got the above outfit at age four, I've loved the ol' West. Part of my family even came across the country in a covered wagon, so I guess I come by it honestly. I've always loved horseback riding, and when I was a kid, I could never decide which I wanted to be more, a cowgirl or an Indian, so I alternated regularly! Join me to celebrate my birthday with a special Rhythm Club birthday dance with you. The 1940's had a "New Look" in the fashion world, and now we have a "New Look" at our website. Yes, Stanley Sheff (Maxwell DeMille's alter ego, or is it the other way around), our sensational web host and designer, worked with me all last week on updating our website. Thank's to his special gizmo genius, he has given us all the modern technology but with our swing vintage look. Our first webpage was designed back in 1998, and had really become a bit klunky and outmoded. Thanks to Stanley, our menu is much easier to navigate, and the pages really look great. By looking great, I mean, they are both attractive and informative. We used to have 24 menu buttons in a block that you had to search through, UGH, now we have eight major buttons that have drop down menus -- much, much easier for browsing! As if Stanley didn't have enough to do, he also created a neato myspace page -- take a look at http://myspace.com/swingshift. You're amazing, Stanley! Thanks, loads! 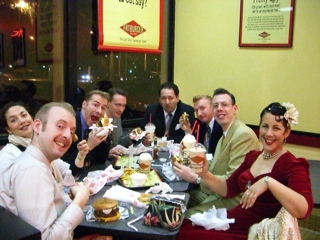 Jive Aces start their evening out with a sumptuous meal at Fat Burgers, then wow the crowd with their electrifying performance at the Rhythm Club. Rusty joins the band for "Singin' in the Rain" and the dancers pack the floor for a record nite at the club. 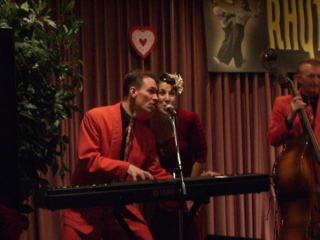 Three cheers for the Jive Aces! Hip hip hooray! Hip hip hooray! Hip hip hooray! True to their publicity, these guys have got it all: "Real Style" "Real Music" and "Real Entertainment." 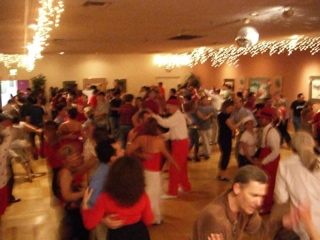 The Rhythm Club was packed with happy dancers, many of whom we haven't seen in years. It seems everyone couldn't wait to see that popular band direct from the UK -- The Jive Aces. Our local master of Master of Ceremonies, Maxwell DeMille, add that extra special touch to an already flyin' evening. There is a rumor running around that the boys may be back in March. Cross your fingers! Take a look at the new scrapbook of the evening's festivities. FIRST "TRACK SERIES" DVD READY -- "ORANGE"
SECOND ONE OUT NEXT WEEK -- "SILVER"
The Track Series is a 6-DVD set. Each DVD is regularly priced at $30. Buying all six would cost you $180, but we are offering an early bird discount price of $125. Pre-order now and save $55! Order one for yourself and a friend. "You'll be greatly pleased by Rusty & Ron's instruction. They are smooth and clean dancers, and very, very talented." "It's wonderful, it's outstanding! Rusty & Ron do such an excellent job of teaching and just putting it out there. My gosh, it's great!" Oh boy! The first "Track Series" dvds arrived -- the Orange Track. We got our first box load and had a little "dvd feeding frenzy" at classes. Ron and I are super proud of our work here, and stay tuned for further announcements, and more good news. Although our initial super-duper pre-sale discount has expired, we have a new super (no more "duper") pre-sale discount of $125. Click HERE to get yours today. Keith and I couldn't wait to sit down and watch it - which we did Wednesday nite. Love love LOVE the Orange Track DVD. I can tell that the Track series will be my favorite Lindy instructional video; the explanations are crystal clear and evenly balanced between advice for the men and ladies; the moves are VERY fun; and you and Ron have perfectly preserved the playful, bantering tone of our classes that help a student feel comfortable. Brava! 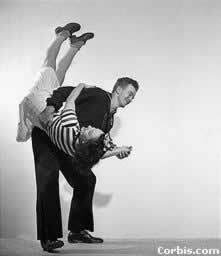 One of our favorite swing dance legends is still in the hospital -- John Mills (creator of "Johnnie's Drop"). I spoke with his lovely wife, Ann, last night, and she told me that it looks like he will be there for about three more weeks. They have finally isolated the problem and are treating him successfully. Keep your good thoughts going so that he can come home soon. John still does not want any visitors. But I made sure to let Ann know how much we all miss him and how much he means to us. 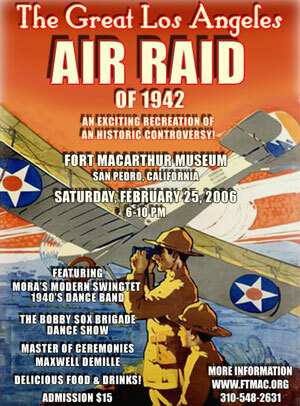 FORT MACARTHUR - "THE GREAT LOS ANGELES AIR RAID OF 1942" On Saturday February 25, 2005 The Fort MacArthur Museum is proud to present what is quickly becoming one of our most popular signature events. The Great Los Angeles Air Raid of 1942 is the museum's celebration of one of the most fascinating and controversial events in Los Angeles History. A night when literally thousands of people both Military and Civilian were convinced that Los Angles was being attacked from the air, and even from space!!! What really happened that night is a debate that will probably go on for years, but for those of us at the Fort MacArthur Museum, it is a time to remember the feeling of those early days of the war. In February 1942, the realities of the second world war was just starting to become evident here in the southland, and many community events continued on almost like nothing had ever changed. The Great LA Air Raid of 1942 is a fundraiser for the Fort MacArthur Museum and attempts to recreate the atmosphere of a 1942 social evening out, interrupted by the reality of war. AND, CELEBRATE RUSTY'S ACTUAL BIRTH DATE! WE'VE BEEN TOLD THERE WILL BE CHOCOLATE CAKE! Yep, that's right, Rusty's birthday is February 25th (you can remember this because it's also Zeppo Marx's, Enrico Caruso's, George Harrison's, the day Vesuvius erupted... you get the picture). John Kanaster has assured us there will be chocolate cake and that Maxwell DeMille will lead everyone in a rousing "Happy Birthday".